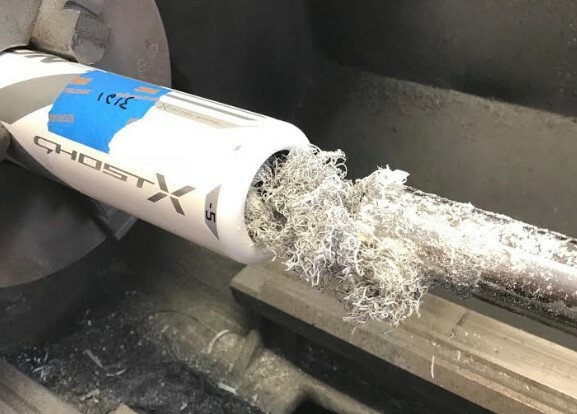 We took two identical bats (the 2018 Easton Ghost X in a USSSA Drop 5) and had one shaved. (That is, we had some of its inners cored out so its barrel was more flexible). Then did a number of tests including two different home run derbies as well as measuring their swing weight and compression. That data, combined with a ton of reading and conversations give us 6 things you should know about shaved bats. (See more swing weights here). Let us first be clear. Using a shaved bat is against the rules of every baseball or softball league we are familiar with. For the record, not only is very likely the bat is illegal in the league you are using, you could face criminal consequences if you use a shaved bat and its hit ball injures another player. There may be a HR Derby or two a year where manipulated and unsanctioned bats are legal (see, for example, the NCAA CWS HR Derby in Omaha). But, aside from those rare occasions there isn’t a moment we condone the use of shaved bats. They are dangerous, illegal and, to put it in no uncertain terms, flat out cheating. If you were closely associated with travel (USSSA) baseball in 2016 you remember the blue and white CF Zen that was eventually banned. You will also remember that you could spot that bat across the park not by it’s looks but by its sound. The bat sounded hollow and deep. It sounded like you dropped a big rock into a well and it splashed into the water at the bottom. Blubmp. That bat was never shaved, but that bat was illegal for a reason. The composite had been manipulated enough during its work it that it was ultra hot. But, do note, it would be nearly impossible to claim a bat is shaved just by its sound. Each brand and model have their own characteristics. If you could find another one of the same bat that had the same amount of work in and then compare the sound you might be on to something. But, good luck with that. See our video above to hear the differences. There are several leagues, derby’s, exhibitions and showcases that allow shaved bats. This makes up the vast majority of sold shaved bats. Even the 2018 College World Series Home Run Derby, for example, allowed any type of bat. It’s a tough line to walk when most willing to buy a shaved bat are doing it for “legal” purposes. But, long story short, we removed the links. Finding where to buy a shaved bat is easy enough if you know how to use Google. Using a shaved bat anywhere that it is not allowed is flat out cheating and dangerous. We condemn it in the strongest language we can. 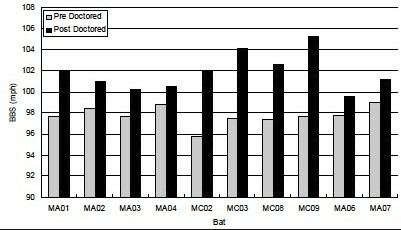 Others have measured the differences in shaved vs non shaved bats. In short, shaved bats hit the ball much faster—anywhere from 2 to 6mph exit speed more. Although several factors determine how much further you’d hit a ball with a shaved bat (see below) it is fair to say that an average of 30 to 50 additional feet is a reasonable expectation. Of course, we are talking about a well hit ball at a good launch angle too. The shaved bat in our test, although originally identical, swings 7% lighter than its original counterpart. Removing the shavings removed the 1.5 ounces from the bat and decreased the MOI from 8800 to 8200. A lighter swinging bat, assuming it is swung at the same speed, will not hit the ball as far as a heavier bat. Of course the trampoline effect has increased on a shaved bat and can make up for that lost weight at impact. But, do note, if you are getting your bat shaved it will swing a noticeable amount lighter. We think a more reasonable way to determine if a bat has been shaved is to simply weigh it on a kitchen scale. Bat companies, notorious for having bats above their sticker weight, have yet to produce a bat (in all our time of doing this) that weighs LESS than the sticker weight. Shaved bats weigh less than their sticker. Our shaved bat that should weigh 27 ounces (32/27) ended up weighing 26.55 ounces. The original bat weighed in at 28 ounces. Some argue that using a compression tester is a fail safe way. But this is not as true as it used to be. Non-linear designs in bats these days change the transferable nature of compression tests—making them less and less useful. (We talk about that in our rolling article here). a simple kitchen scale does not have the accuracy to tell one that a bat is 27.00 vs. 26.55 oz. if you said a lab scale that was accurate to three-decimal places, then i would concur. Hmmm. We aren’t sure of this. Some kitchen scales are pretty accurate—measuring grams of flour/butter/whatever. (28 grams in an ounce). But, fair enough, kitchen scaled might not be the best litmus test for shaved bat. But they are the least expensive. And if a bat weighs LESS than the stated weight–even on a kitchen scale—we think it probable something funny is going on. We’ve weighed, on a kitchen scale, over 500 bats. Only two have come back below the stated weight: The Rawlings THREAT USA (not shaved) and the shaved bat we used for this write up. Anyhow, thanks for the comment and something to consider.